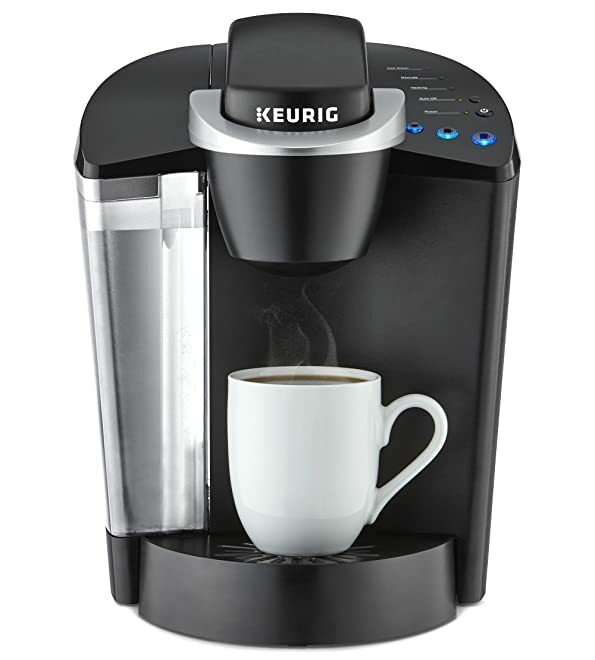 The Keurig K55 measures 9.8 x 13.3 x 13 inches and weighs approximately 12 pounds. 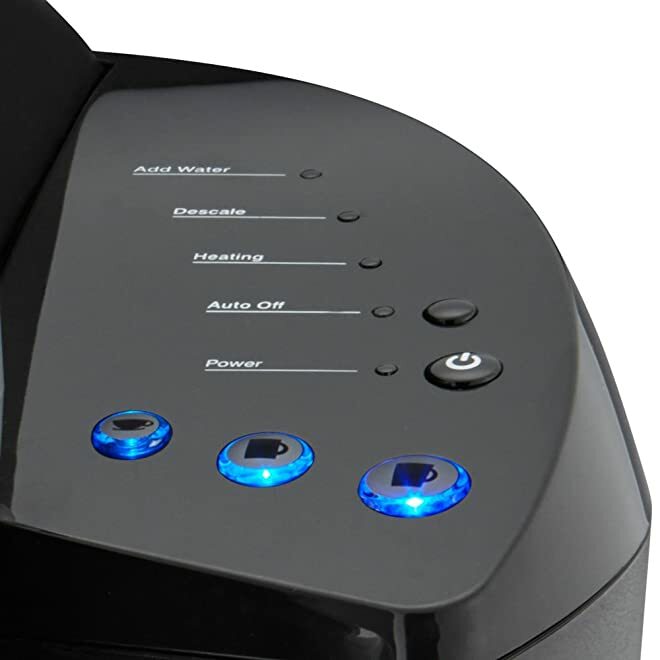 The K55 has the same sleek design as other Keurig coffee makers and comes in red and black. This Keurig model uses the original K-Cup pods but is not compatible with the newer Vue, K-Mug, or K-Carafe pods. The Keurig K55 allows you to brew 6, 8, and 10-ounce K-Cup pod sizes in under a minute. The machine has simple push-button controls with indicator lights to guide you through the programming and brewing process. The generous 48-ounce water reservoir allows you to brew approximately six cups of coffee without having to refill. The Keurig K55 also has an energy-efficient auto-off function to automatically turn the machine off after 2 hours of inactivity. The Keurig K55 is extremely easy to clean. The assembly that holds the pods is removable and can be washed in the dishwasher. The water reservoir should be removed occasionally and washed by hand. The machine also comes with a removable tray to catch stray drips. The Keurig K55 comes with a 1-year limited warranty. What Can I Make with the Keurig K55? You can also choose from a wide selection of tea and chai beverages as well as hot chocolate. When brewing these various beverages, especially hot chocolate, it is important to follow the manufacturer’s instructions for cleaning the machine to remove residue that can affect the flavor of your coffee or cause clogs. The Keurig K55 is also compatible with the company’s K-Cup reusable coffee filter, which allows you to use your own coffee. One attractive feature of the Keurig K55 is that you can run the brew cycle without inserting a pod for instant hot water. This allows you to fix packages of oatmeal or soup in a flash. As with any of the various Keurig models, the primary advantages are the speed with which it brews and the fact that your coffee is always fresh. While the K55 may not offer some of the options of the more expensive Keurig models, its basic programming controls can be a bonus if you find that complicated digital displays are too much to manage before you have had your first cup of coffee. The extensive lineup of K-Cup options allows you to experiment with a variety of hot beverages. • the water not heating adequately resulting in cold coffee. This problem does not seem to be limited to the Keurig. Many of today’s coffee makers have so many moving or computerized parts that they simply do not last as long as the simple models of a few decades ago. Is the Keurig K55 for Me? 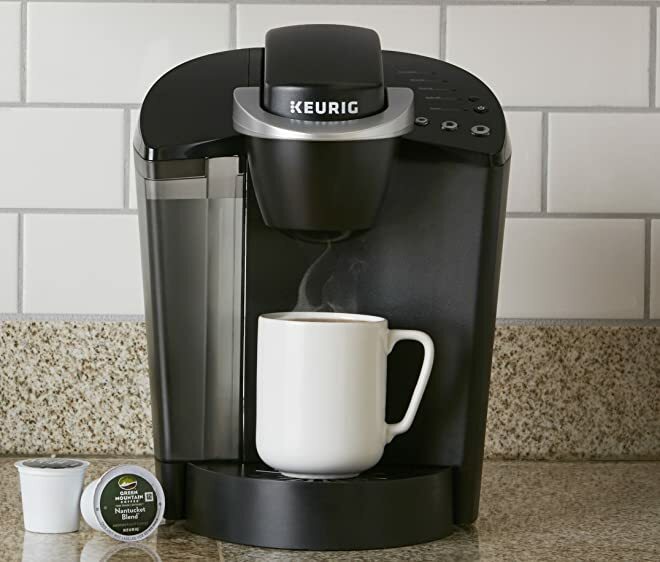 The Keurig K55 is a great option for anyone who wants a cup of great coffee without the hassle of scooping, measuring, or waiting for a full pot to brew. The machine’s compact footprint makes it suitable for anyone with a small kitchen or limited counter space. 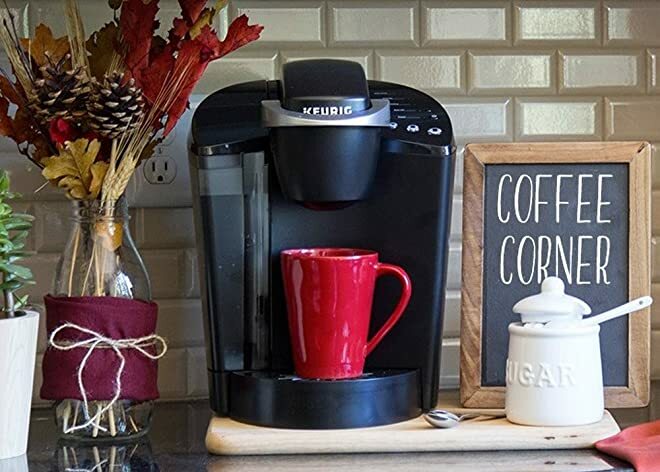 A single-serve brewing system like the Keurig is ideal for homes where family members have different schedules since no one is left with stale or burnt-tasting coffee. It is important to note that the Keurig K55 does not have the carafe setting that is available on the more expensive models, so it may not be a good option for anyone who routinely serves coffee to a large group. You may also want to invest in a higher-end model if you like to have the option of customizing the strength and other aspects of your coffee. The K-Cups can be rather expensive if you regularly drink large amounts of coffee; however, you can save money by purchasing the optional reusable K-Cup. In terms of function and quality, the Keurig K55 is on par with similarly priced coffee makers. This particular model is a nice compromise between the ultra-basic K15, which is geared for the occasional coffee drinker, and the higher-end models that some consumers may find too complicated or expensive.